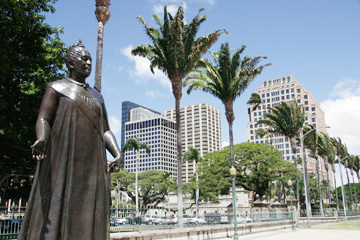 Queen Lilioukalani's statue at the State Capitol makes a convenient rallying point for political protests, but peaceful souls also find she's nice to look at. No one's neutral when it comes to Queen Liliuokalani, Hawaii's last reigning monarch. She is either (a) a beautiful, talented and soulful representative of a downtrodden people or (b) a wily politician whose power play blew up in her face and was deposed. Either way, and likely both, the queen is a totem to generations in the islands and one of the major figures of Pacific history. Given that, you'd think there would be representations of Liliuokalani everywhere. But the primary one is tucked in the pedestrian mall behind the state Capitol, on a plinth just slightly elevated above the common man. "The Spirit of Liliuokalani," as the statue is known, is a 6-foot sculpture by artist Marianna Pineda. It was dedicated April 10, 1982, after being cast in Boston and shipped to Hawaii. Pineda sculpted the queen standing and moving, almost as if, in a private reverie, the monarch is dreamily dancing the cha-cha. The regal informality has made the statue popular with visitors, who often decorate it with leis. The queen lived at Washington Place until her death in 1917. Capitol workers prone to ghost stories say they've heard the statue talking. More functionally, due to both its central location and political baggage, the statue serves as a rendezvous for protests in the Capitol district. A similar, smaller edition of Pineda's work stands in the courtyard of the Queen Liliuokalani Children's Center. In 2003, somebody stole the 100-pound bronze from the center, along with two portraits of the queen and her husband, a koa clock and a feather lei. A while later, the statue was discovered dumped alongside a Kalihi road. Perhaps there were no eBay bidders on it. Pineda, who died in 1996, also created the documentary "Search for the Queen," about sculpting the bronze memorial. There is occasional chittering in the Legislature about shifting the sculpture to the grounds of nearby Iolani Palace. Such a move, however, doesn't match the palace's plans to keep the area as 1890 as possible.